Without further ado, doTERRA’s March promotions are available now through until March 31. An incredible offer for Ice Blue, commonly known throughout oily circles as “the man converter” for its fast relief for discomfort associated with sport or over-activity. Place a minimum 200PV order between 1st – 31st March 2016, and receive a FREE Ice Blue Rub AND a FREE 5ml Ice Blue essential oil blend with your order. (Maximum of 4 orders per person). In case you didn’t already know, doTERRA have lots of essential oil based CLEANING products! That’s right, no more nasty chemicals. The Clove in the On Guard Cleaner Concentrate, like all On Guard products, is awesome for mould, the Eucalyptus and Wild Orange help to clean and disinfect, and the Cinnamon adds to the lovely aroma that will fill your house. 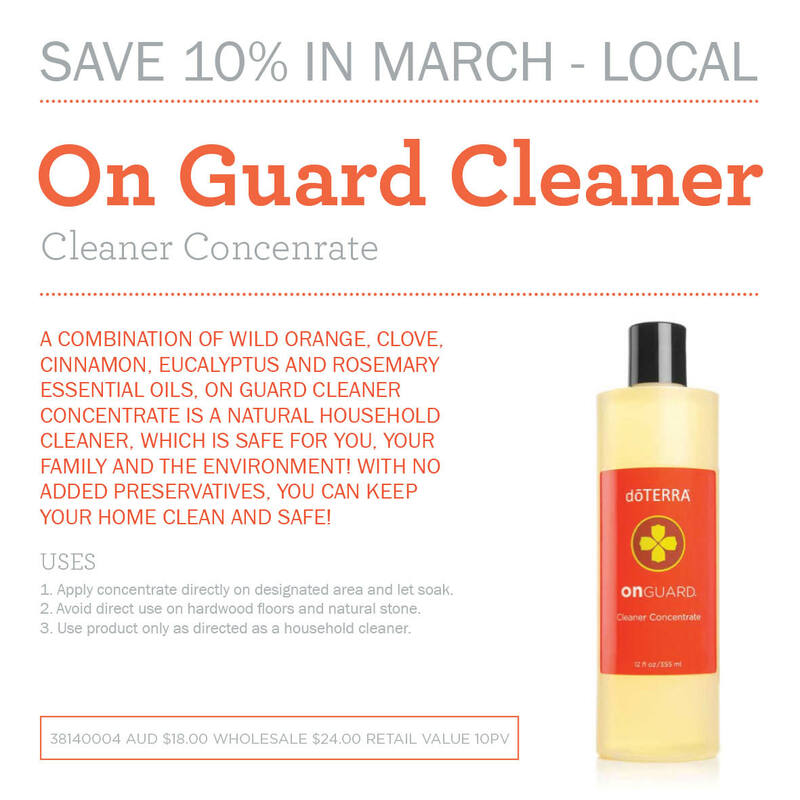 On Guard Cleaner Concentrate is 10% off throughout March, so now is the time to stock up, ready for the upcoming Winter nasties. Place a minimum 125PV LRP order before 15th March 2016, and get a FREE 15ml Wild Orange essential oil blend. Limited to 1 per customer. Wild Orange, touted the “Oil of Abundance”, and one of the most uplifting and fragrantly popular oils can be purchased at 10% off during January 2016. If you’ve met us in person, you’ve no doubt smelled the fantastically invigorating scent of Wild Orange, and you might have been lucky enough to receive a free sample. Here’s your chance to get the full 15ml bottle.